Neumann und Carlo Carlone. Bei Schloss Falkenlust. Neumann and Carlo Carlone, interior designers. Falkenlust is close by. The first documented reference to Brühl was recorded in the year 1180 when Archbishop von Heinsberg of Cologne founded a manor house which soon became a significant local seat. In 1469 Brühl became the capital of the county and was chosen as the residence of the Cologne Archbishops. It remained their residence for 150 years. The castle was blown up in 1689 and later most of the town was destroyed by fire. Elector Clemens August built Augustusburg on the ruins of the old castle. The architects were Conrad Schlaun and Francois de Cuvillies and the roccoco staircase was designed by Balthasar Neumann. Clemens August had a passion for falconry and beautiful surroundings, which shows in the elaborate but certainly tasteful inner and outer design. He changed the building's original character as a moated castle into a modern residence. When Napoleon saw the palace in 1804, he expressed regret over the fact that it had no wheels! In 1944, a bomb hit the North Wing and in 1945 the Main Wing was hit by an artillery barrage. 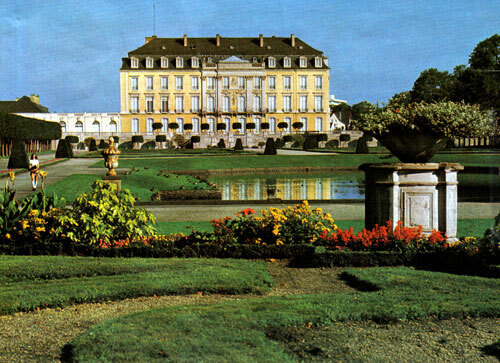 Today the palace belongs to the government of North Rhine-Westphalia and is used as the representative seat. This page was last updated on 15 November 2008.